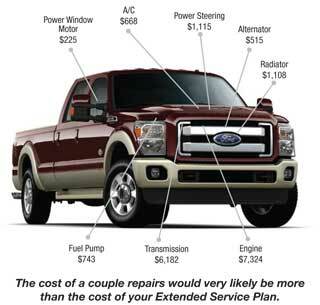 Ford F-250 Extended Warranty - Ford Protect For F-250. You´ve worked hard to save up and buy your Ford F-250. Do you really want untrained technicians working on it, using generic or even used parts? Why not protect your investment with the best coverage possible? It doesn´t mean that you have to pay more. Most aftermarket/third-party companies would have a hard time beating our pricing, even though they offer inferior coverage. Do you really want to go to battle on every claim? Third-party warranty companies nit pick every claim. They try to negotiate labor hours, hourly rates, parts prices and other incidential charges, oftentimes leaving you to pick up the difference. Why put yourself in that position? Coverage From The Company That Built Your Ford F250! There are many extended warranty companies that say that they offer an extended warranty for a Ford, but there is only one that is from Ford, covered by Ford, backed by Ford and good at every Ford dealer in the country and that is Ford ESP. There is no better coverage, available anywhere for your Ford F-250, than Ford ESP. Ford does not want this to be the last Ford F-250 you´ll ever own. They want you to be happy with your purchase and tell others about your ownership experience. They know that an F-250 owner that is covered by Ford ESP will be much more inclined to purchase another Ford product if they have had a good experience with Ford ESP. Ford looks at the big picture. Sell a good product, provide a good ownership experience and the customer will buy more Ford products. It´s that simple! Walk into the service department of your local Ford dealer. Tell them that you have a problem with your Ford F-250 and your have Ford ESP. See the smile on the Service Advisor´s face. Ford dealers are self-authorized to handle most claims. They don´t need to call anyone to get permission to fix your F-250. They don't have to negotiate with the warranty company. They don´t have to turn to you and tell you how much you have to pay for a repair that should have been fully covered!